President Akufo-Addo has revealed that Cabinet has given its approval for the Wa and Navrongo campuses of the University for Development Studies (UDS), Tamale, to become autonomous universities. Speaking at the 25th-anniversary celebration of UDS, Tamale, on Saturday, 10th November 2018, President Akufo-Addo told the gathering that cabinet has given its approval for the Wa Campus of UDS to become an autonomous University. “Indeed, the influence of students from the Schools of Medicine and Allied Health Sciences continues to be felt in the health delivery system of, especially, the Northern, Upper East, and Upper West regions, where, unfortunately, over the years, most hospitals and clinics have had only one resident medical doctor. UDS has been of great benefit to society, and the nation is grateful to you,” he added. 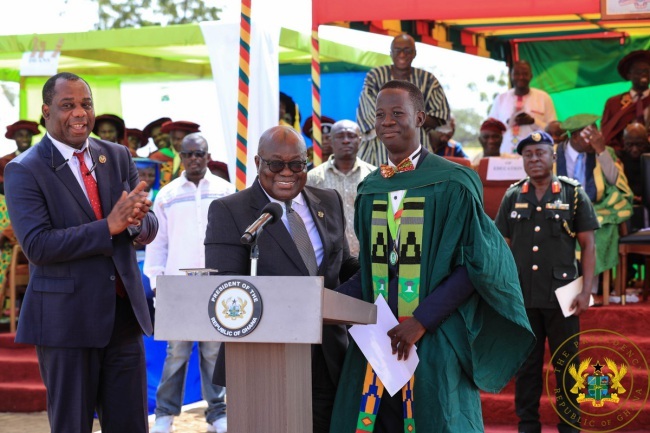 These two examples, President Akufo-Addo emphasized, symbolize the strong correlation that exists between the attainment of education and its effects on a nation’s development. President Akufo-Addo assured UDS that it will receive the support of the government towards addressing its needs. One of the most important, immediate challenges, which will confront UDS and other Universities, he said, will be the dramatically increased population of students, who will be seeking admission in some two years, as a result of the Free Senior High School policy.